Only 10% of the clothes donated to charity or thrift stores are sold. 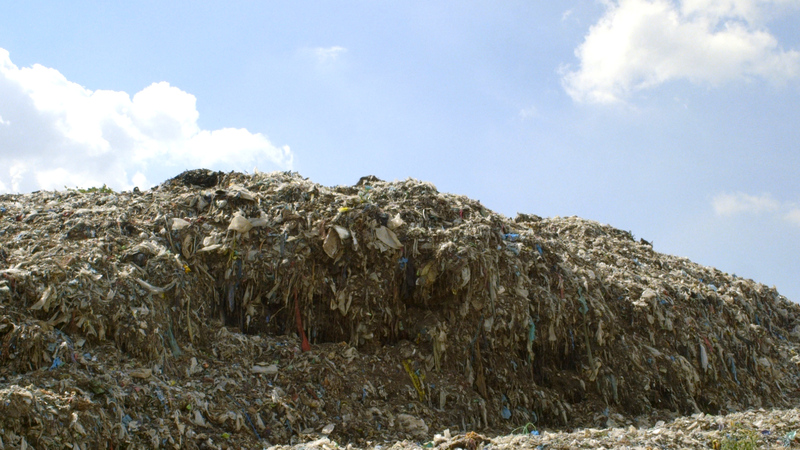 The other 90% ends up in landfills or flooding markets in developing countries overseas. Hurting their economy and environment. I’ll be honest, I have always loved the idea of donating my clothes. You think you’re doing something to help out another person. I will be the first to tell you that I’m the Queen of Rationalization. I can find a bright side to most anything. Need a new dress for a party? No prob, I’ll just donate it later. Before watching the documentary, I happened to read the popular The Life-Changing Magic of Tidying Up by Marie Kondo, and am slowly “Konmari-ing” the crap out of my house. Reducing and organizing my clothes was freeing, but also eye-opening. I had A LOT of clothes I didn’t wear. Either it didn’t fit or I didn’t really like it anymore, whatever the reason, I had clothes just sitting there. Taking up space and collecting dust. So after an honest purge, six garbage bags were filled. The worst was the tiny little dagger I felt when looking at an item that I loved and it just sat there reminding me of time when it did fit. How freeing it was to kick those clothes – and the negative self-talk that came with them – out of my house. These, the clothes that I loved but couldn’t wear, were the ones I gave to friends. What an absolute joy it was to see them try them on, twirl around, and feel beautiful. Clothes that give the gift of happiness. Another bag went to my dear friend who hand delivers clothing and food to homeless people on the streets of Boston. Clothes that can help keep them warm. The rest was dropped off at Savers. 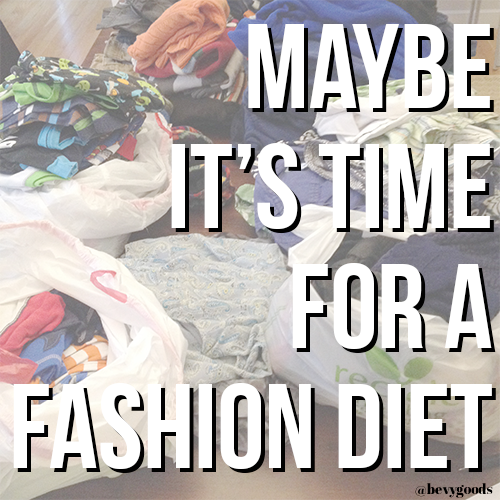 Clothes that will find a new home (and hopefully not in a landfill). Invest in quality pieces that will last. Here’s a list of some of my favorite ethical fashion brands. Have extra jeans? Host a Sole Hope Shoe Cutting Party to cut shoe patterns to be made into shoes for kids in Uganda to protect their feet from harmful jiggers. Shop at thrift, vintage and consignment stores. Go rock a vintage Valentino jacket at your next holiday party. And jeans are always better worn-in. Pull together clothes to be given directly to homeless or similar missions. Cradles to Crayons does an excellent job of involving the community (great for kids!) and giving directly to those in need. Reduce the amount of cheap, fast fashion clothes you buy. I’m still working on this too, especially shopping for my boys. They only wear athletic pants (what they call “fancy pants”) and destroy them/grow so quickly that I end up at cheaply made places like Old Navy and Target. Just as we teach our children: actions have consequences. Our need for more more more + cheaper cheaper cheaper has massive ethical and environmental consequences. The surprising thing for me, especially after Konmari-ing my own clothes, was the psychological impact of fashion in my own life. Why do we buy so much? Why do we feel like more will make us happier? Why do we feel like we deserve it? Stuff will never fulfill us. Stuff will never bring lasting joy. As a side note, True Cost covers how horrible the cheap leather industry can be. At Bevy Goods, we are committed to investing in and using responsibly-sourced leather, which means our leathers are vegetable-tanned (reducing the amount of dangerous chromium that used) or comes from facilities that adhere to strict environmental codes and conditions. We are creating bags with lasting style + purpose: ethically-made bags that carry you from day to night. 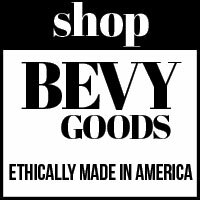 Sign up at Bevy Goods to join us on this journey and be the first to know when we are launching. And while you’re at it, let’s connect on Instagram, Facebook & Twitter!